In an era of superbugs, bioterrorism, and pandemics, the need for new technologies to fight a host of rapidly evolving and potentially deadly diseases has never been greater. PMI is committed to undergraduate and graduate student research training in an internationally-recognized world-class facility. There are over 100 faculty, full time staff, graduate and undergraduate students currently working in the Institute with additional researchers closely associated with PMI on the NAU campus. Isolating C. difficile in an anaerobic chamber. Collecting fleas in the field. Fleas will be extracted for DNA and screened for the presence of plague. 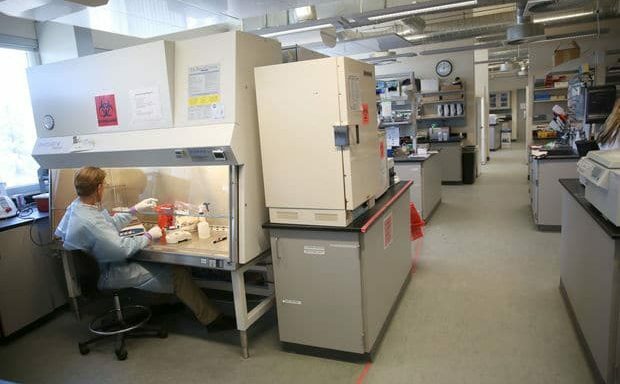 Working in a biosafety cabinet in the PMI Biosafety Level 2 (BSL-2) laboratory. Northern Arizona University and The Pathogen & Microbiome Institute are proud to host The 58th Annual Meeting of the Arizona-Nevada Branch of the American Society for Microbiology April 13, 2019.